The Jewish Federation of Greater New Orleans continues to work on making New Orleans a vibrant Jewish community, and one result was announced at the Federation’s annual meeting on Sept. 20. Earlier this year, four Israeli musicians from Partnership 2Gether city Rosh Ha’Ayin visited New Orleans. At the annual meeting, Federation President Alan Franco announced that as a result of the visit, the first-ever New Orleans jazz festival in Israel will take place in Israel’s music city, Rosh Ha’Ayin, in May 2013. This is but one of many upcoming highlights for the agency, which will celebrate its centennial next year. Julie Wise Oreck will chair the centennial celebrations. 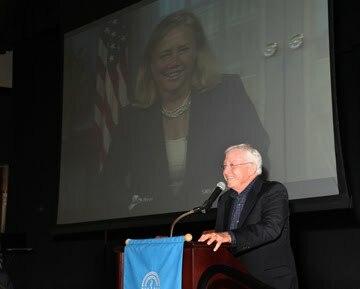 The meeting, held at the Uptown Jewish Community Center, was also the annual meeting for the Jewish Endowment Foundation of Louisiana. Senator Mary Landrieu spoke by video remote to the gathering. In another video presentation, the Federation announced it raised $2,535,044 in the annual campaign, highest since 2008. There were 1633 gifts, including 79 new ones. Super Sunday raised a record $147,756, and there were four new Lions of Judah this year. Lions are women who contribute at least $5,000 per year to the annual campaign. Still, Franco said while the community may be celebrating the announcement in August that the local Jewish population had reached pre-Katrina levels, the annual campaign has not. “We have to be more creative in our funding, and we are doing that,” he said. Nevertheless, he said, “so much has been accomplished” to make New Orleans an attractive community. Newcomers continue to come in, with 197 inquiries in the past year and 55 newcomer grants issued. Newcomer and young adult groups continue to involve the community’s next generation, with 450 participating in the Young Adult Division over the year. As part of the evening, Sarah Pasternack and Henry Miller received the Anne Goldsmith Hanaw and J. Jerome Hanaw Tikkun Olam Awards for Campaign Excellence. The award honors the man and woman whose volunteer work for the Federation’s Campaign best exemplifies the concept of Tikkun Olam. Robert Brickman received the Herbert and Margot Garon Young Leadership Award. Franco also recognized Margot Garon for receiving the Kipnis-Wilson/Friedland Award at the International Lion of Judah Conference last month. She “truly represents everything that is great about our community,” he said. There also were presentations from the Lagniappe Fund, which allowed donors at a certain level to designate additional funds to local and overseas projects. The current year’s projects included purchasing the latest technology offerings for teachers and students at the New Orleans Jewish Day School; increasing homemaker services for seniors in the community through Jewish Family Service; expanding the community through the continued efforts of the Jewish Newcomers Program; and strengthening the connection with Rosh Ha’ayin by supplying musical instruments to children and teenagers who otherwise would not have access to music education.